Digital technology is driving rapid change in the car-parking industry — electric cars, driverless cars, car sharing, app-based searching, booking, digital payment systems — the list could go on. The two key areas where digital technology is changing the car-parking industry landscape are the use of Big Data and the use of media manager digital signage to enhance the customer experience. The development of Big Data has provoked great expectations for those who manage parking facilities. In plain terms, Big Data collates data from different sources to reveal patterns and trends associated with human behavior. This data can then be used to help create personalized and engaging digital signage customer experiences. The car-parking industry is data-rich, comprising integral data points, such as payment transactions, occupancy data, sensor data, length-of-stay data and more. Making use of Big Data and analytics can help parking managers to optimize pricing and parking availability based on factors such as the weather, special events or flight schedules for airport parking. Potential takeaways from data could be to create a dynamic pricing strategy — similar to Uber — based on demand and even offer promotions to attract customers. The parking facility is often the first touch point for the customer journey but can frequently be overlooked in terms of the overall customer experience. 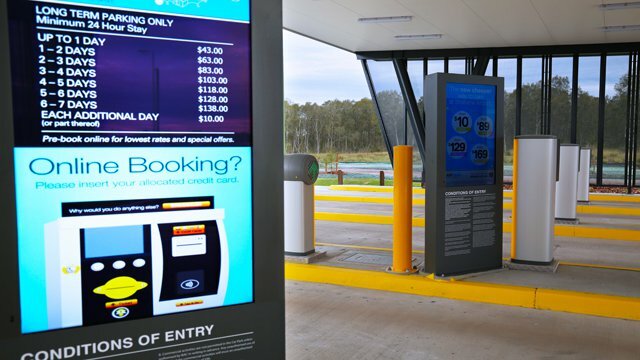 The use of digital signage within parking facilities can not only inform customers of parking-related information, but also display safety and journey information as well as providing timely and targeted promotional messages from nearby retailers or businesses. Book online — An online reservation system allows for a more streamlined customer experience as visitors can pre-book a parking space to reduce the hassle of driving and searching. Companies can collect data through this system by requesting general, vehicle and payment details. License-plate recognition — If the customer has registered and pre-booked a space online, the car can be recognized via license-plate recognition, allowing quick entry. If payment details have been registered, the parking costs can be calculated and charged to the customer’s account on exit. This is much easier than having to remember to pay before making their way back to the car. Digital parking signs — Located at the entry of parking facilities, digital parking signs can integrate with license-plate recognition software. Once data has been gathered about a customer, the digital sign can display customized and tailored content. This content can include welcome messages, pricing information, available parking spots, car wash and valet specials, and promotional messages from nearby retailers or businesses. To help manage supply and demand, parking operators can also quickly and easily adjust parking prices. With a traditional, static parking sign, a price change would entail a minimum two-week turnaround time with approvals, printing and shipping. Digital parking signs allow parking managers to alter pricing within minutes due to cloud-based content management systems. Digital video walls — Digital video walls can be based anywhere and everywhere within a park facility. Similar to digital parking signs, these can be linked to license-plate recognition software, allowing video walls to be used for directions — if the customer has an allocated parking spot — or relevant promotional messages. The Brisbane Airport Corporation in Brisbane, Australia is a great example of innovative parking facility management. The company began their digital disruption with an installation of a video wall above the parking pay machines. Accessible through a cloud-based content management system, BAC can instantly update or schedule content, ensuring no promotional opportunity is overlooked. Digital parking signs have also been installed at the entry and exit of the state-of-the-art AIRPARK allowing the ability to dynamically manage pricing changes and promote parking specials. Digital technology is a critical enabler in creating the seamless end-to-end experience that customers now expect. Enhancing the parking experience with the clever use of digital technology will help parking operators attract new customers, grow market share and increase revenue. Most importantly, though, digital integration into the delivery of parking services will help generate data and customer insights, allowing parking operators to proactively manage and improve the customer experience.